Canopy by Hilton is announcing “Paws in the Neighborhood,” a new dog-friendly policy and check-in program at all of its hotels in North America. Just as their owners will be treated to a local welcome amenity upon check-in, so will the dogs, who will receive a Paws in the Neighborhood Cinch Pack, a Planet Dog Orbee ball, house-made or locally sourced dog treat, a dispenser with pickup bags, as well as a dog’s guide to the neighborhood highlighting parks, vets, groomers, pet supply stores, and dog-friendly restaurants. For its dog amenity kits, Canopy has partnered with Planet Dog, a manufacturer of environmentally friendly pet products. Guests rooms (called Just-Right rooms) will also be prepped before arrival to include a dog bed, and food and water bowls. Fleece-line collars and leashes from Planet Dog's best-selling hemp line will be available on loan. To bring the experience home, every Canopy guest will be given a promo code for 20 percent savings every time they shop with Planet Dog. Related: The Best Dog-friendly Beaches in the U.S.
Because he says that Canopy puts an emphasis on ease and comfort, “taking the stress out of traveling with your four-legged friend is just another way the brand brings its thoughtful ethos to life,” he told Travel + Leisure. For a non-refundable cleaning fee that the company says will not exceed $50, guests can bring up to two dogs for their stay. Dogs weighing more than 75 pounds will be permitted only at the property’s discretion. 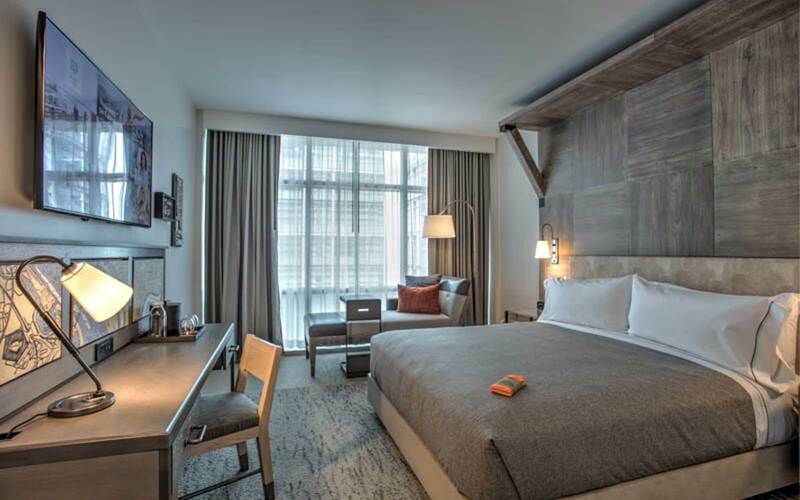 Canopy by Hilton just opened its first hotel in the U.S. at The Wharf in Washington D.C. This is the second Canopy property to open since Hilton announced the brand in 2014 as a “natural extension” of the hotel’s neighborhood. The first Canopy hotel debuted in Reykjavik last year, and Hilton has announced plans for 16 more to open over the next two years, at locations in Rockville, Maryland; Portland, Oregon; Dallas; Ithaca, New York; London; Minneapolis; Oklahoma City; Atlanta; Toronto; San Antonio; West Palm Beach; Charlotte; Baltimore; Columbus, Ohio; and Hangzhou, China.